ShoeboxLA is a specially constructed display table about the size of two shoeboxes laid side by side. This highly portable space -- which, like Open Arms, uses the simple, rectangular structure of a traditional gallery but in a whimsical manner -- roams the streets of L.A. for three-hour pop-up shows in random public locations. Founders Sophia Allison and Paul W. Evans, artists themselves, wanted to create a mobile art experience that interacted closely with the environments it found itself in. After about a year in operation, the shoebox has appeared in a bookstore, an ice cream parlor, a bowling alley and a shopping mall. 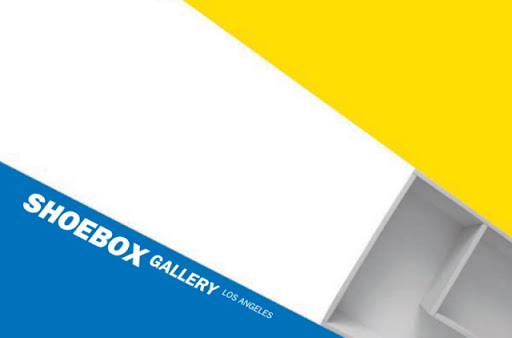 Artists are invited to create new work that is specifically geared toward the dimensions of ShoeboxLA (no pre-existing work is accepted). Back in September, the gallery planted itself in the also tiny Los Feliz Triangle Park to show artist Jay Erker's Cut Both Ways, a handmade book of sliced and layered fashion-magazine images. On a boiling hot day, Erker (who also runs the nearby Weekend Gallery) stood under an umbrella, turning the pages for a steady stream of curious and enthusiastic passersby.